Alex Roberts Artist: Reflections on Taste - the publication is out there! 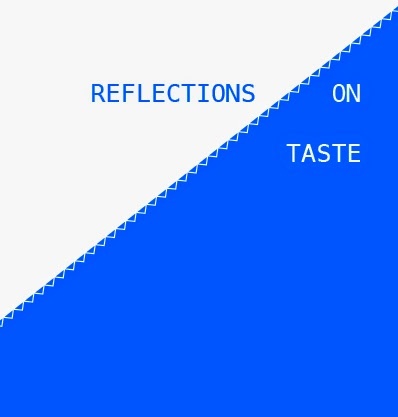 Reflections on Taste - the publication is out there! A collective of Chelsea's Fine Art and Textile Design postgraduate came together to present their own observations and questions of taste after Bourdieu. Led by UAL academics, Dave Beech* and Malcom Quinn*, the reading group for 'Taste After Bourdieu' was inspired by Own Jones' writing on the demonization of the working class and 'Chav' culture, and Jukka Gronow's examination of taste and fashion, informed by Immanuel Kant and Georg Kimmel. Through a visual, tactile and interactive confession booth, the group sought to provoke the subtle and sometimes obvious denials, ironies and conflicts of private versus public tastes. Because we elicit ourselves in relation to those around us, a question of ego becomes pertinent: how can you, as an individual, foster a taste that is unique, not perverted by conformation to the standards of others? Whilst this may seem like a leading question, it merely points to the networks we enact, and the ways in which we position ourselves within them. To what extent does desire for a beneficial position, one that garners acceptance or validation or sorts, skew our behaviours? Are we made to play the role of fearful subject, telling the cultural emperor how magnificent their new clothe are? In the worlds of Fine Art and Design, such questions of positioning and mediation can be related to the commercially viable product. As makers of things, the question arises: can taste transcend behaviour? There is a difficult ground to be broken, and a pertinent question remains: is the extent to which identity and expression are bound to systems of commodification, a bad thing? The Confessional Booth and the publication is a culmination of the groups' thoughts, questions and observations. *Malcolm Quinn is Associate Dean of Research and Director of Graduate School Camerwell, Chelsea, Wimbledon Graduate School. To read more, or for further information about the collective publication, please contact Alex directly.